Joe Awada was born in Beirut, Lebanon on March 12, 1958. His mother sent him to the United States shortly before the Lebanon Civil War broke out. There he lived with his uncle, who worked for the Ringling Brothers Circus, and Joe Awada got a job there selling peanuts and cotton candy. However, Joe Awada did not enjoy working the concession stand and he started teaching himself how to juggle, inspired by the circus’s juggler, The Grand Picasso. However, Joe Awada never asked The Grand Picasso for advice, learning instead by observation and practice. He practiced for two years before the American Continental Circus signed him at the age of 16. Joe Awada became the first person to ever go from the concession stand to performing. Joe Awada made it to Las Vegas in 1977, when he got a job performing at the Circus Circus. He Joe would go to the poker room in between his performances, but playing poker was just a way to have fun, as he was off performing most of the time. Unfortunately, his juggling career ended when he got into a car accident, and despite all the physical therapy he could never return to his juggling form. The poker room manager at the Circus Circus offered him a poker dealer job after hearing about the Joe Awada’s accident, and he took it. That was when Joe Awada made a serious effort to learn poker, observing the players and the moves they made. Joe Awada became a full-time professional poker player, but didn’t like the job, thinking it was too hard of a life. Instead, he began entering smaller tournaments while getting involved in business. Joe Awada is now the CEO of Gaming Entertainment Inc. He finished 2nd to Scott Fischman in the 2004 WSOP $1500 No Limit Holdem event, an event Joe Awada would’ve won if he hadn’t suffered a bad beat. He also won his first bracelet in the $5000 Seven Card Stud event, defeating Marcel Lüske. Three months after his WSOP win, Joe Awada made it to the final table of his first World Poker Tour event. 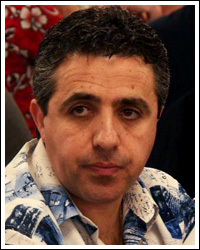 Joe Awada currently lives in Las Vegas, Nevada with his wife and six children.